Here’s a question to think about: What do Between Two Ferns and March Madness have in common? Any guesses? How about President Barack Obama. This March, the President of the United States took to YouTube and ESPN to give himself some positive publicity. This was much-needed after Obama experienced his lowest job approval rating at the beginning of the month. On March 13th, Obama appeared onBetween Two Ferns with Zach Galifianakis, a segment on Funny or Die’s YouTube account. The video was an internet sensation the moment it was uploaded to YouTube, accumulating over 4.2 million views to date. The video features Galifianakis grilling the president with a number of ridiculous questions which Obama had no problem rebutting. The entire segment was hilarious and it was a great way to show off a side of Obama that many people have never seen before: deadpan, sassy, and witty. Obama even threw in a few good-humored jabs at Galifianakis which made the segment even better. “Let’s get this out of the way. What did you come here to plug?” Galifianakis asked. “Well, first of all, I think it’s fair to say that I wouldn’t be with you here if I didn’t have something to plug,” Obama joked. “Healthcare.gov works great now. …What we want is for people to know that you can get affordable health care. And most young Americans right now, they aren’t covered. And the truth is they can get coverage all for what it costs you to pay your cell phone bill,” he continued. Only six days later, Obama made an appearance on ESPN for his annual “Barack-etology” segment. 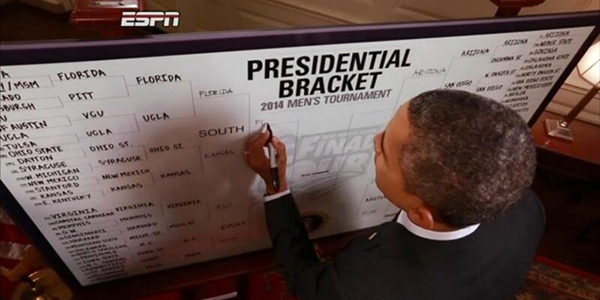 Since 2009 the president has appeared on the sports network to fill out his own March Madness bracket. It is easy to see that Obama possesses a vast knowledge of the game and the current NCAA teams as he discussed key players and tough matchups across the tournament. While on ESPN’s show, Obama seemed like a regular person while trying to pick the right teams to advance. Since the creation of “Barack-etology” the president has only picked the tournament winner once, but who can blame him? March Madness is basically an educated guessing-game when it comes down to it. Last year the president did admirably, finishing in the 74.4th percentile, according to Bleacher Report. March was an impressive month for the president in both the political and public relations realm. As Obama hurried to improve his approval ratings, he also tried to push for Americans to sign up for Obamacare before the March 31st deadline. Thanks to his public service announcement on Between Two Ferns, as well as his other social networking techniques, healthcare.gov had over seven million people sign up and get health care coverage. While nothing tangible came out of Obama’s visit to ESPN, the annual “Barack-etology” segment is always enjoyable for basketball fans to watch. Obama gave Americans a sense of who he is outside of his job in both of his public relations appearances in March. Although these did not significantly improve his approval ratings, they did not significantly hurt them either. ← Join PRSSA at 2000 Degrees Tomorrow!